Cholesteatoma is a benign growth of skin in the middle ear and/or mastoid that can lead to infection and more serious problems involving the brain and facial nerve. If the retracted eardrum sac is relatively small, without infection or hearing loss, and if the keratin can be cleaned out in the office under microscopic examination at periodic intervals, observation is appropriate. In all other circumstances, surgery is required to help prevent the progression of cholesteatoma and infection. The primary goal of surgery for cholesteatoma is treating the infection. The secondary goal is to restore hearing. As previously stated, an uncontrolled infection in this area can lead to complications. In all circumstances, surgery involves general anesthesia, and the procedure can last one to two hours depending on the size of the cholesteatoma and the extent of infection. The delicate procedure is performed using a high powered microscope. Patients typically go home the same day of surgery. There are temporary restrictions following surgery, which include restraining from heavy lifting, nose blowing, and sneezing with the mouth closed. (Patients may sneeze with their mouth open, if a sneeze is unavoidable.) 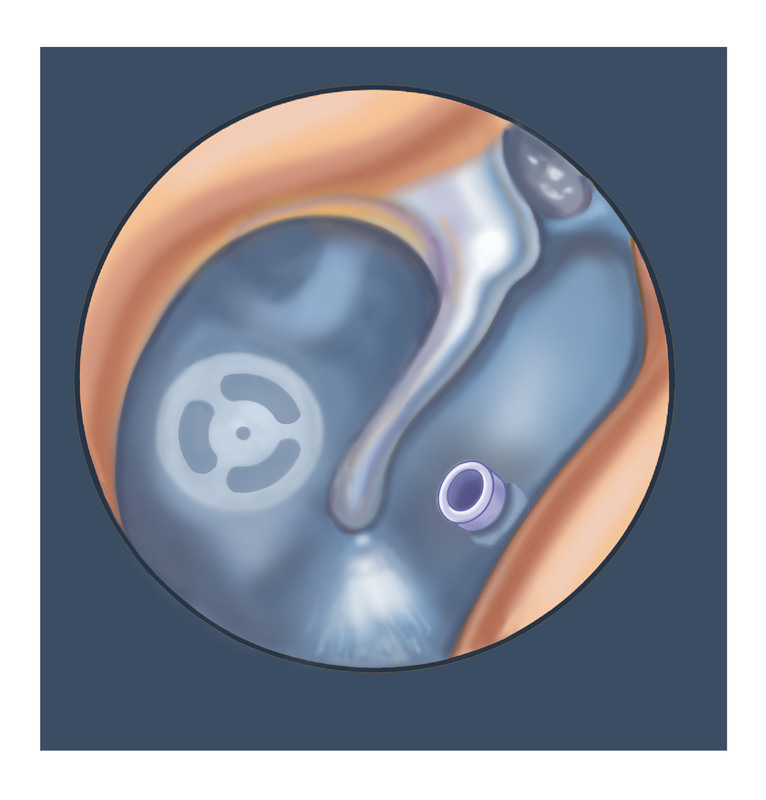 Patients are typically seen as often as weekly until all ear canal packing is removed. Most patients have their surgery on Thursday or Friday and return to work on Tuesday. We are not in the business of training medical students, residents, or fellows. Doctors in training will not be operating on you. I perform all of these procedures from the beginning to the end. 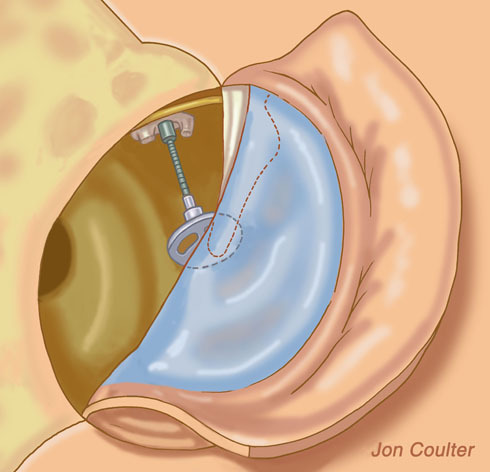 Surgery can be performed either through the ear canal or in combination with an incision behind the ear. Step 1: An incision is made in the ear canal and behind the ear. Step 2: The mastoid bone and eardrum are exposed. Step 3: After partial removal of the mastoid bone, the cholesteatoma near the eardrum and in the mastoid is exposed. Using a microscope and very fine instruments, the cholesteatoma is removed. Oftentimes, the incus needs to be removed as well. Step 4: Either during the same operation or in a separate operation, a prosthesis is placed. Here, the bony partition between the ear canal and mastoid has been preserved. This shows an illustration of the implant used to reconstruct the ossicular chain (the connection between the bones) in the middle ear. This shows a partial ossicular chain reconstruction where the stapes bone is still intact. This shows a total ossicular chain reconstruction where the majority of the stapes bone has been removed. 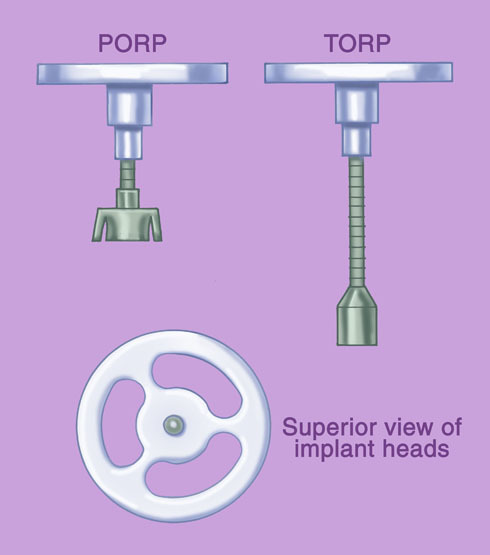 This shows a middle ear implant (prosthesis) as it appears against the eardrum. A tube is also in place in the ear drum. Frequently, the mastoid bone located behind the ear must be explored to remove any cholesteatoma that may have spread there through the middle ear. This can be done in addition to the tympanoplasty, as described above. Whether the bony partition between the external ear canal and mastoid is removed or not depends on the extent of disease. Canal-wall-down refers to the removal of this bony partition. Canal-wall-up refers to keeping this bony partition intact. Experienced surgeons can usually perform this type of surgery in about two hours.